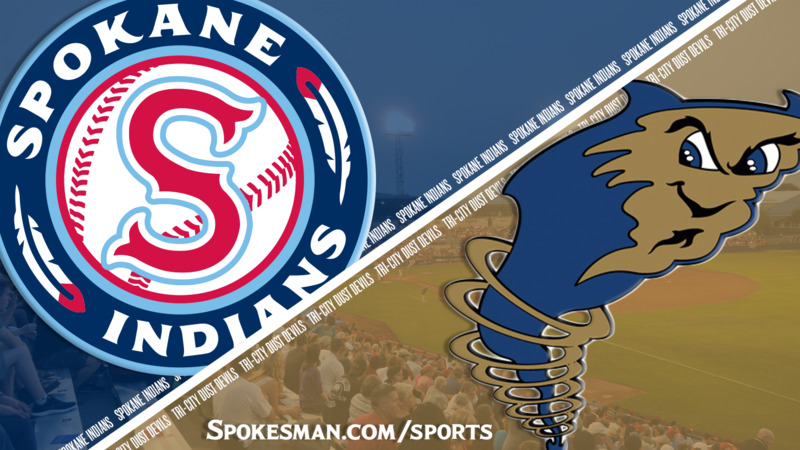 PASCO – The Spokane Indians’ road to postseason hit a major detour Wednesday. Michael Curry’s three-run homer to left field in the seventh inning allowed the Tri-City Dust Devils to rally for a 5-3 victory to open a three-game Northwest League series at Gesa Stadium. Curry’s homer came with two outs on a two-strike pitch from Xavier Moore, who had just relieved Francisco Villegas (0-1). The loss dropped the Indians (18-15 second half) two games behind North Division-leading Vancouver (20-13) with five games remaining. Vancouver, which rallied Wednesday to defeat Everett 10-3, plays Saturday through Monday in Spokane to end the season. Spokane took a 3-2 lead in the fifth, highlighted by J.P. Martinez’s RBI triple to right. Martinez scored on Jax Biggers’ fielder’s choice, and Biggers scored on an infield error. Dust Devils relievers Jonathan Guzman and Efrain Contreras (1-0) combined to hold the Indians hitless for the final four innings, striking out seven. Spokane and Tri-City (16-16) have split 10 games this season. Published: Aug. 29, 2018, 10:33 p.m. Updated: Aug. 29, 2018, 10:37 p.m.